As a rule, there is no easy way to see multichannel statistics and to compare the effectiveness of every platform. To make things worse, marketing channels do not reveal the profiles of your content downloaders. Read how we promoted our whitepaper in 5 channels and compared the effectiveness of each channel using UTM parameters and marketing automation. Sometimes you can bump into a website with a ridiculously long URL. For example, the one in our 3-day email marketing course. This is where UTM parameters come to the picture. The UTM parameters help to sort your incoming traffic according to the sources. 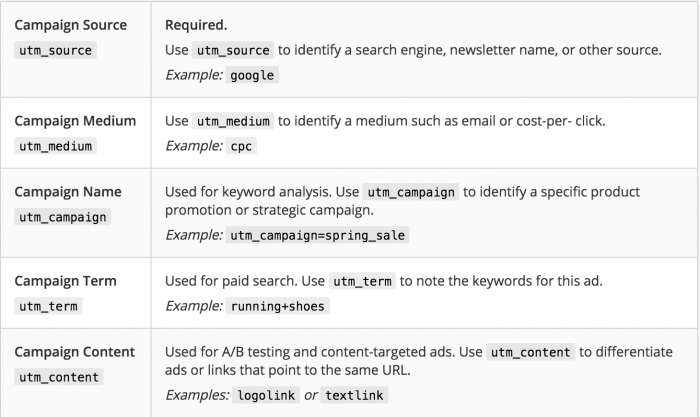 There are 5 types of UTM parameters you can add to your URL to help track traffic. Google Analytics Demos & Tools provides a detailed explanation on that. When someone clicks on a URL with UTM tags, those parameters are sent for tracking to your Google Analytics account. You can then check the performance of your traffic sources in the Acquisition tab. However, just looking at your GA reports won’t allow you to utilize all the existing data you have on your contacts. So we dug a bit deeper using our tools. We set the UTM parameters to our landing page form made with LianaCMS. Since the CMS is integrated to our marketing automation platform, we could track the UTM parameters all the way back to the automation tool. This way, we could see the multichannel visitor statistics and the contact info indicated in the lead form. 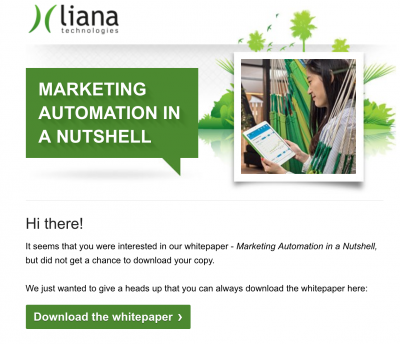 We created our brand new marketing automation whitepaper. Short and concise landing pages provide higher conversions, especially for guides and whitepapers. Also, we launched a drip campaign targeted at whitepaper downloaders. The automated chain consisted of an email sent in 2 days after the download. The purpose of the drip campaign was to dive users deeper into the topic of marketing automation and to ramp up their interest in our marketing automation solution. Thanks to drip campaigns, we can teach and activate our downloaders with automated message chains. The newsletter is created with LianaMailer. Additionally, we used the retargeting feature to send a reminder email to those who visited our landing page but did not end up downloading the whitepaper. With this friendly email reminder, we showed our customers we care for them and boosted whitepaper downloads. A win-win! What channels did we use to promote the whitepaper? We used a unique URL with the relevant UTM parameters for each social media channel. In the example below, the UTM Source shows that the link was used on LinkedIn and the UTM medium indicates the cost-per-click campaign. Apart from the social media channels, we promoted the whitepaper in our monthly newsletter. With LianaMailer, setting the UTM parameters was quite easy. We included the relevant UTM tags straight in the tool and the link was generated automatically. Lastly, the whitepaper landing page was placed at the end of our blog posts, for example, in this article. By creating a segment for the whitepaper downloaders in our marketing automation platform, LianaCEM, we could see the number of downloads from each channel. We could also check several channels to measure, for instance, all social media leads. For example, LinkedIn brought us 49 downloaders. What’s more, we were able to see the contact info of our downloaders and their history. We also created a segment of “Retargeting Downloaders” in LianaCEM. The segment revealed the number of downloads we received after the reminder email has been sent. Contact info of the downloaders was also shown. Lastly, we checked how many people received and opened the newsletter from the drip campaign. The icing on the cake was the opportunity to see what links a user clicked in the email. This showed what type of marketing automation content interests a lead most of all. By properly utilizing UTM parameters and marketing automation, we evaluated the effectiveness of 5 different marketing channels. Gathering customer information helped us in becoming more data-driven marketers. Not to mention the amazing leads that we brought to our sales team. Integration of our marketing automation platform to our CRM was crucial. We could track the point when the leads were converted to sales even though our actual sales process is handled face-to-face. We found the channels producing the highest ROI in every market we operate since the CRM showed sales conversion sources. At the same time, we defined less effective platforms. As for now, we will take advantage of the most effective marketing channels. Our sales force will focus on utilizing rich customer data. 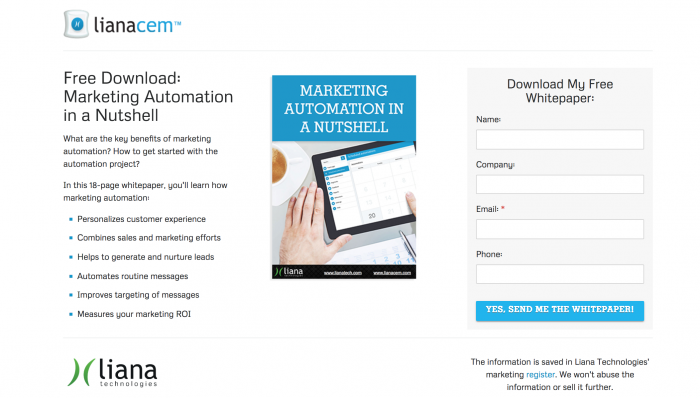 Interested in data-driven marketing automation? Want to see how this works in practice? Contact our specialists and let’s discuss further. 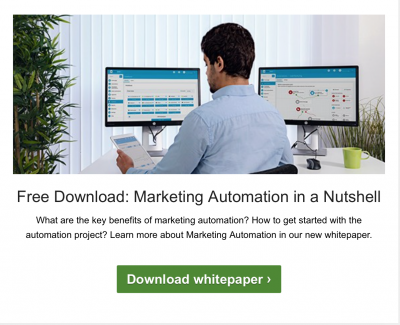 Survey: What are the Benefits of Marketing Automation? Elena is a Marketing Coordinator at Liana Technologies. When you don't see her passionately writing a new blog post for Liana, you can find her baking delicious cheesecakes or jogging. You can connect with her on LinkedIn.